Dürr is building a paint shop in Mexico for its customer BMW Group that meets the requirements for connected Industry 4.0 production. This ultra-modern plant featuring the first integrated smart factory concept from Dürr in the world is being built at the San Luis Potosi site. Dürr is supplying the complete paint shop, from pretreatment (PT) and electrocoating (EC) through to the spray booths with application technology to the ovens. The waste water treatment plant, the installations for the complete deionization system of the water (DI plant), and the shop ventilation are also included in the scope of services being provided by Dürr. The respective processes are designed around the consistent integration of smart solutions. EcoSmart VEC optimally adapts the energy use of the oven to its workload at any given time. In the first stage, the paint shop is being designed for a capacity of 35 vehicles per hour, with the option to increase the throughput to twice this capacity later. Only the PT/EC area is designed for 60 vehicles per hour from the outset. BMW will use its tried-and-tested, fully automatic IPP (Integrated Paint Process) in this plant, which eliminates the primer and therefore also a drying phase. In terms of the paint shop layout, Dürr relies on a simple industrial building without any intermediate levels in conjunction with multi-functional body stores with high-bay storage technology at the BMW Group site. This concept offers the advantage of sorting the vehicles with elective access, which eliminates the need for an additional painted body store of the conventional type. The focus on sustainability starts right from the PT/EC area. The RoDip rotational dip process is used in pretreatment and electrocoating. Since the bodies are fully rotated in the tank, RoDip does not need entry and exit inclines. The smaller volume of this shorter tank reduces the quantity of water and chemicals required, and therefore also the energy consumption for tank conditioning. The use of membrane technology in PT/EC as well as in the waste water treatment plant reduces the water consumption and the volume of waste water even more. A total of 30 EcoRP E/L133i robots from the third and therefore latest generation ensure efficient paint application in San Luis Potosi. These can be operated on a rail running either above or below in the top coat and clear coat lines. They are used as both trunk openers and for exterior and interior painting. For the first time on the American continent, the new Dürr painting robot with cloud-enabled control is being used. The newly developed EcoRCMP2 process and motion controller controls the third robot generation from Dürr. 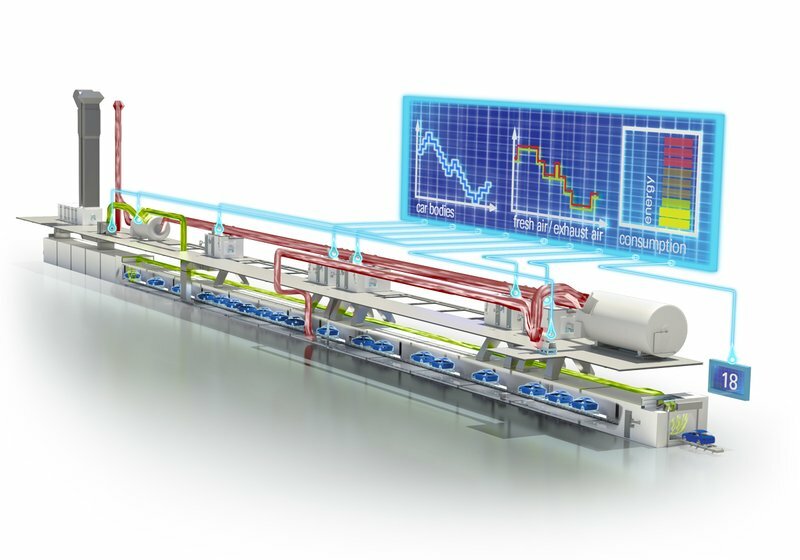 An example of the smart factory concept is the integrated safety controller for monitoring the workspace and speed of the robots. A multitude of sensors ensure networking of the robot data with the higher-level maintenance software and control system. The EcoScreen Maintenance Assistant software from the digital@DÜRR range, which is being used for the first time, determines the plant condition based on the number of switching cycles of the valves or the load profiles of the servo motors in the robots. This enables preventive maintenance planning and increases the plant availability. Service activities can therefore be based on up-to-date plant data, and are no longer oriented to predefined maintenance intervals. In the application technology, the interaction of the dosing pump, color changer, EcoBell3 atomizer generation, and the award-winning cleaning device EcoBell Cleaner D2 minimizes paint loss and detergent consumption when changing colors. The scope of delivery here also includes the paint and high-viscosity material supply as well as 25 sealing robots from the EcoRS series. These robots seal seams on the bodies fully automatically, apply sound insulating mats and underbody protection, and draw delicate seam lines in the visible parts of the door area. For paint overspray separation in the spray booth, BMW Group in San Luis Potosi once again has chosen dry separation using the EcoDryScrubber. The Bavarian car manufacturer was the first OEM to use this technology in its plant in Regensburg in 2010, and it is now in use in more than 75 painting lines worldwide. The reason for its popularity is the energy saving of up to 60% in the spray booth. By completely eliminating water and chemicals, up to 90% recirculated air can be used in production. This reduces the cost of conditioning fresh air and is the deciding factor in the outstanding energy efficiency of the spray booth. The new V5.X system software is being used for the first time. It improves the performance of the EcoDryScrubber by enabling the system to be self-regulating. As a direct result, optimum use is made of the limestone powder for binding the overspray, thereby reducing consumption. BMW is also using a product from the digital@DÜRR range for the ovens. The fully automatic EcoSmart VEC fresh and exhaust air control ensures air management by energy on demand: the oven’s energy use is optimally adapted to its workload at any given time. Instead of a constant volumetric flow rate, the fresh and exhaust air is controlled as a function of the number of vehicles currently in the oven and their position. Another measure to save energy is the recovery of waste heat from the thermal exhaust air purification systems (Ecopure® TAR) of the ovens. The waste heat is made available again to the production plants as hot water using a waste heat boiler. To reduce the solvent emissions, as a further environmental measure the exhaust air flow from the clear coat booths is purified using an Ecopure® KPR adsorptive concentration system before it leaves the plant. The plant will commence operation in San Luis Potosi from August 2018. Well before production ever starts, Dürr is thinking about efficient maintenance and impressive ease of use: without poring over files, the electronic EcoDocu documentation system enables direct access to all plant-related data via QR codes and enables smooth ordering of spare parts.